From the same team that brought you the highly acclaimed guides to Assassin?s Creed IV Black Flag, Assassin?s Creed III, Revelations, Brotherhood and Assassin?s Creed II, this brilliant guide includes: main, side, and co-op missions, optional challenges such as Paris Stories, Relic Hunts, Murder Mysteries, Temporal Rifts and Heists ? all streamlined for 100% completion. There is an at-a-glance walk through that covers every step of Arno Dorian?s adventure supported by detailed, annotated screenshots and maps, all unlockables, all bonuses, all collectible items, all hidden Abstergo files, all Achievements and all Trophies so that you won?t miss a thing. Statistics, diagrams and expert analysis provide a comprehensive understanding of all game systems and features such as the new skill system, villa renovations, Creed points, and new equipment like the Phantom Blade. 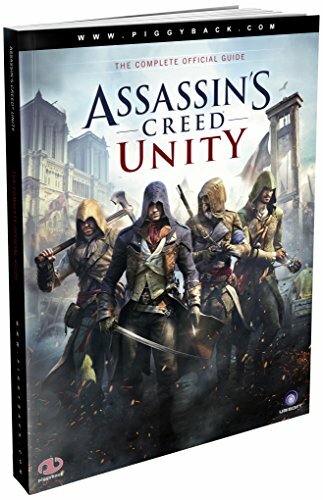 Includes an insightful series recap sequence and an extensive analysis of all major events in the Assassin?s Creed Unity storyline. A handy strategy guide book for Assassins Creed gaming fans. This paperback book has 275 pages and measures: 27.5 x 20 x 1.5cm.